Exam management information system is a technology from where a successful exam can be conducted. This system allows an examiner to create exams by creating questions first or assigning already defined questions. 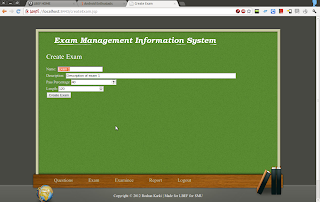 After that an examiner can create examinee and assign the created exam to him or her. The examinee can login with provided login details and give exam in allocated time period. After that the result will be processed and saved permanently in database. This system will be very useful in any place that conducts exam. Such place can be school, college, IT institutes, educational institutes, job hiring and son on. The questions, exam and examinee are all different entity in this system. Thus they can be easily edited, removed or created without depending on another. Hence, removing an exam won't remove already defined questions from the system. Easy to handle and flexible. Exams are conducted from ancient history, for it to be grade students or promote correct employee or to hire them in first place. But classic examination system suffers from many problems. Be it with security, privacy, confidentiality or fairness. Also its very expensive and time consuming work. With today's time people want to do work fast and wants result fast. You cannot make one wait for three months for their result. 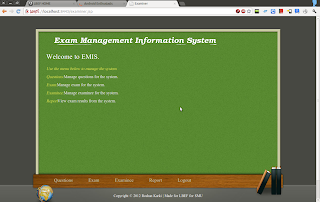 Thus with exam management information system, any school, college, financial institutes, offices, police/army or any other place bearing examination system will benefit. An expected situation in the future does not have to be accepted. One can try to do something about it, by acting. For defin­ing a problem this implies that it is not sufficient to describe the existing state. Therefore, we speak consciously of the situation someone is or is not content with. A description of the situation is therefore a description of a state plus the relevant causal model(s), including the assumed patterns of behavior of the people and organizations involved. A situation is only a problem if the problem-owner wishes to, and wants to do something about it. This implies that a situation must be conceivable that is more desirable than the present one: the goal situation. The existing situation, however, can also be formulated in such a manner that a problem does arise. The existing system suffers from classic problem of question leaking, cumbersome answer sheet checking, unfair grading, printing and managing the overall process. There are many tools to cover the problem but they don’t have the entire required feature. Question can be easily leaked while printing, transferring from one person to other. Checking answer is a very time consuming process. More the examinee more the teacher needed to check answer or more the time needed to complete it. Result publication is another important difficult chaotic process. Very high paper usage which is very bad from environment point of view. 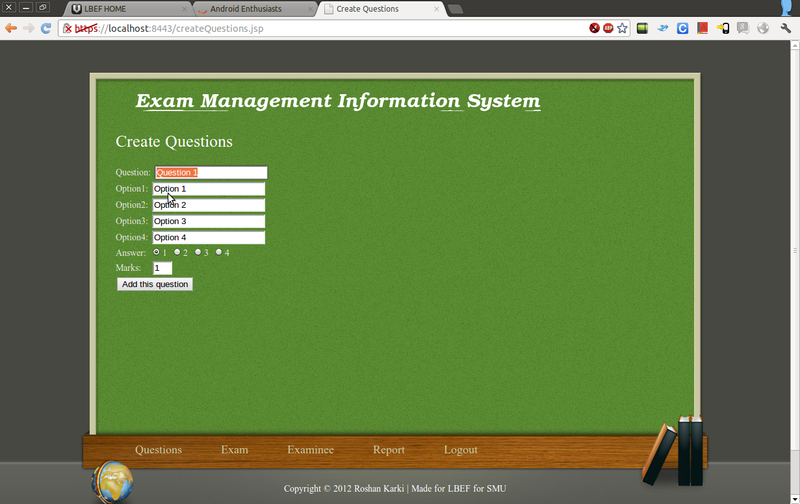 Same questions and exam has to be typed again and again and again. Loss of answer sheet can easily happen. Difficult to make secure delivery of questions. 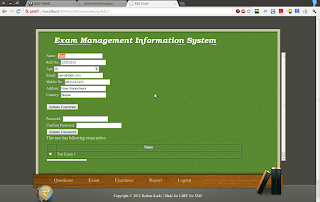 Regarding above circumferences exam management information system is inspired to study and included in university project work. 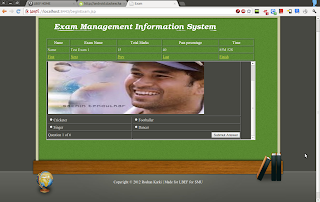 With exam management information system the whole classic approach of exam giving and taking will be revolutionized. 1. Authentication: The software will be only accessed via encryption secure and digest password with salting. Hence the system even if hacked will prevent user's privacy and confidentiality. 2. 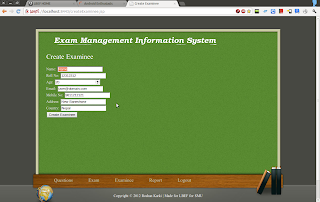 Examiner: The system allows creations of question and exam independent of each other. Hence a question can be easily added and deleted from exam without having to remove it from the system. Similarly exams can be deleted without fear of loosing all the entered questions. 3. Examinee: With simple MCQ questions that also supports image, examinee will be in comfort to give exam. 4. Web Software: AS the software is web software, the users of it only needs a browser to use it. No need to install any hunky funky software. 5. Easy UI: The software has very simple and easy to use user interface. This module will deal with the users logging in the software. If the login is successful then the user will be given permission according to the rights defined. Basically he is administrator he will have full rights. The system uses industry standard highly secure digest password with salting and 1000 times iteration. This makes the system as secure as secure can be. 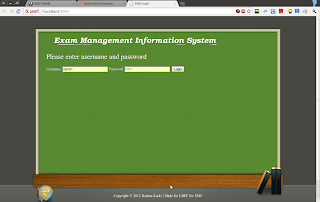 This module will identify if the user logging in examiner or examinee. If the logged in user is examiner then he has full control of the system. 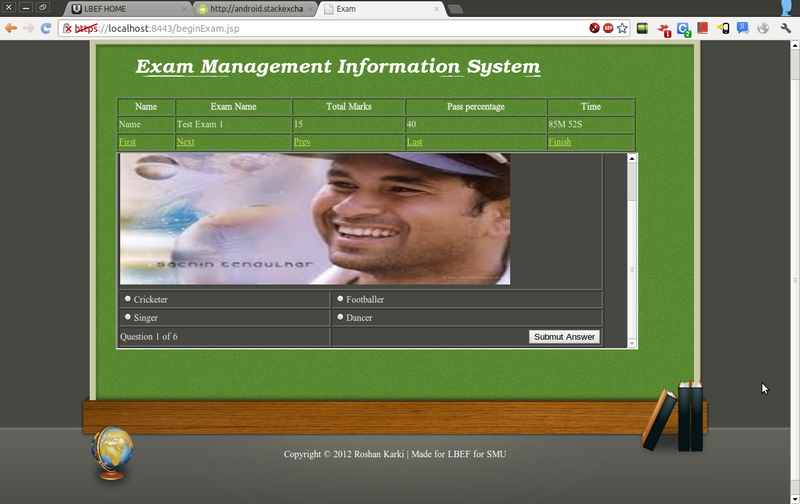 S/He can create questions with or without images, edit them, create exam, edit them and also create examiner. S/He can set/reset and email the password for examinee. So s/he can also email and publish result. Basically s/he is the core of the system. This module will is the core front end of the system. This is where the examinee logins to give exam. Finally the progress will be uploaded and result published. This module handles creation, edit and deletion questions. Question can be edited, added and deleted. Image can be added and deleted. So can the marks of question be changed from this module. 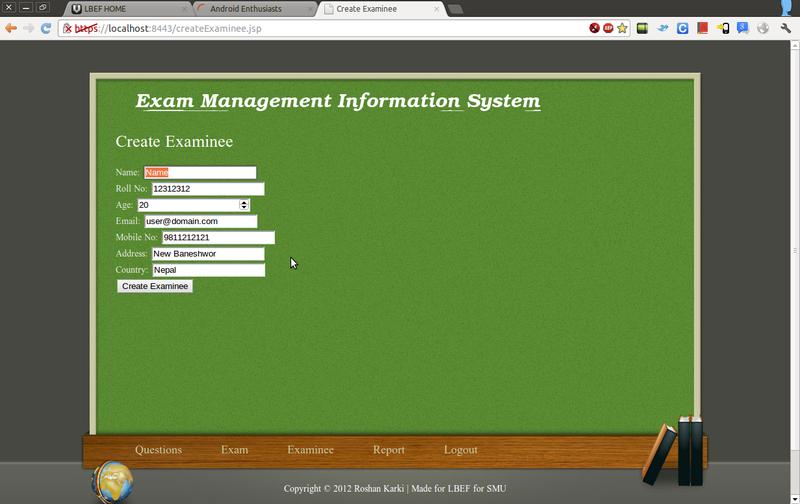 This module handles creation, edit and deletion of exam. Question can be assigned to exam and examinee can be assigned to exam from this module. This “Exam Management Information System” is being developed according to the analysis and studies done. This program could be very much useful to uncover the problems faced with the current software, mainly to maintain privacy. According to my analysis with various websites, I have generated an analysis report and according to which I'll carry on my entire project in the future too. The management analysis, feasibility studies like economic feasibility/ system feasibility/ operational feasibility etc, are all analyzed very well. According to all those studies and analysis I am submitting this proposal and I want to have your permission to start my project. Side by side, I will also try to upgrade the features as far as possible and is feasible. Some of the advanced features are planned to include while many others has to be omitted when those advanced features may override my feasibility studies. Exam management information system is a solution to make any classic exam system look dull and boring. 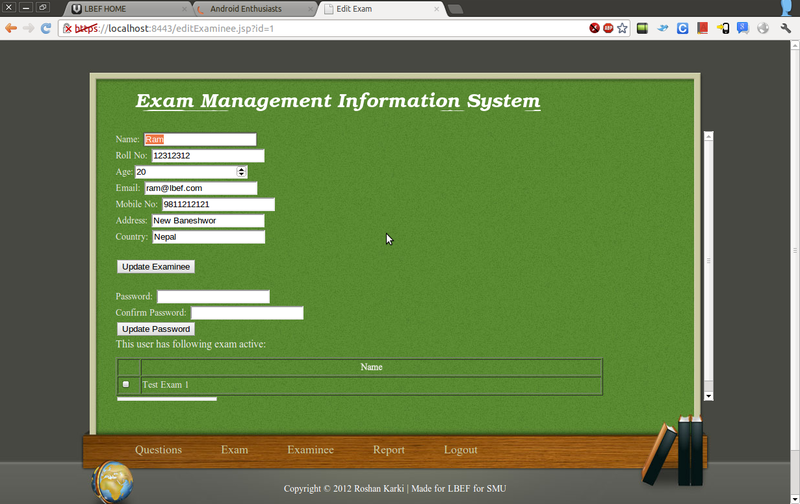 This system will make exam timely, cost effective, efficient and fair. Examination system will no longer be though of a cumbersome process. To move forward in today's education system exam management information system is must. 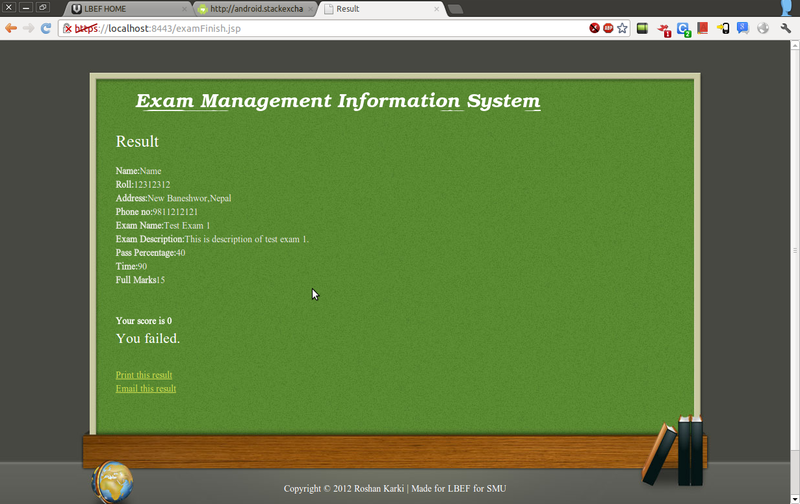 There is no separation of concern in this projects .they look like PHP code ..
i want to know, where to get the database ? can you provide the code for db ? I'll update later. Ping me if I don't. Can you provide the code for the db as well? Also i want to know the deployment process (step by step) of this code as i am a beginner in Java and JSP.